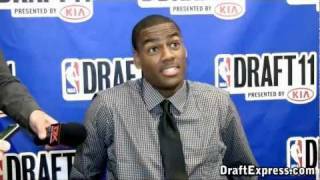 Alec Burks was largely an afterthought when he committed to Colorado-- a skinny 6-3 shooting guard with limited range on his jump shot. Now he's a legitimate-sized NBA wing player and one of the best scorers in college basketball, not to mention the leader of a team desperately trying to make the NCAA tournament. As an indication of how much he has progressed, Burks now ranks fourth in scoring on a per-40 minute basis amongst the top 100 NCAA prospects in our database,. It's not just the quantity of points he accumulates that intrigues NBA teams, though, but how he gets his offense. Burks is a shot creator, a skill that is highly coveted at the professional level. Over two-thirds of his offense is generated by himself, be it in isolation situations, in transition or in pick-and-roll opportunities. He ranks in the top five amongst our top 100 prospects in free throw attempts, and (more impressively) is second overall in makes because of the stellar 82.4% he shoots from the line. Capable of driving in either direction, Burks is a smooth yet explosive slasher with an outstanding second gear. He has excellent speed in the open floor and the body control and ball-handling skills needed to slither his way around opponents and get to the rim. Burks is not yet a great finisher around the basket, as indicated by his sub-50% 2-point percentage. He must continue to fill out his frame as he struggles to finish through contact in traffic. He's a scorer through and through, though. He uses the glass nicely with reverses and such and has a knack for finding a way to put the ball in the basket, even in tight spaces. Unlike most big-time scorers from small(er) colleges, Burks is a fairly unselfish player who is more than capable of making the extra pass. Even if he's often asked to be the one creating and finishing shots for his team (particularly late in the shot clock), he's a nice weapon to have in a half-court offense thanks to his solid court vision and good basketball IQ. When Colorado's starting point guard goes to the bench, Burks will man the position, which is a good indication of the versatility he brings to the table. Defensively, Burks is somewhat of a mixed bag, but he shows good potential on this end of the floor. With his good size, nice length, excellent lateral quickness and solid anticipation skills, he has all the tools needed to guard his position successfully in the NBA. He generally puts in a good effort on the defensive end, getting low in his stance and often guarding the opposing team's best scorerand doing so effectively for the most part. He already ranks as the second-best rebounding wing player in this draft class (after Travis Leslie), which has to be considered a good sign. With his narrow frame and lack of strength, Burks has some issues fighting through screens and will lose his focus occasionally, but based on what we're seeing there's no reason he can't be a good defender at the NBA level. One area of his game in which scouts surely would have liked to see more progress this season is his jump shot. He doesn't take (or make) many 3-pointershe's just 21 of 69 on the season from this range--but he is streaky from mid-range too, a place many Big 12 teams have forced him to operate from by taking away the paint with help-side defense. Burks has converted just 54 of 184 (29%) jumpers this season, largely due to his struggles shooting off the dribble (30 of 118, or 25%). Burks creates good separation from defenders in the mid-range area, but he has a tendency to shoot off balance. He tends to kick his legs out on attempts and not square his shoulders to the basket. His shot selection also leaves something to be desiredhe makes just enough bad shots to lead him to believe he should be taking more off-balance, contested attempts, but not enough to lead his team to a better than 7-7 record in the Big 12 thus far. With his feet set, Burks shows nice shot-making potential, often just throwing the ball in the rim in difficult situations. The minimal arc he gets on his jump shot doesn't leave him very much margin for error. This is an important factor in assessing Burks' NBA potential, as it's unlikely that he'll have the ball in his hands quite as often as he does at Colorado. If he can find a way to become a more consistent outside shooter, his transition to the NBA will be much smoothersomething Evan Turner has learned the hard way as a rookie this season. As we learned with Turner, whichever team drafts Burks will need to put him in a role that suits his strengths, alongside teammates that complement him. The learning curve Burks has shown over the past two years is intriguing, though. There's a pretty good chance he's nowhere near his full potential at the moment, especially given his late growth spurt and the fact that he's one of the youngest members of his draft class, not turning 20 until July. In a draft that looks increasingly shallow at the wing position, Burks stands out with his shot-creating skills and scoring instincts. If he can convince a team that his long-range shooting won't be too much of an issue in the NBA, he'll be a popular name during the pre-draft process.